Online Mixing and Mastering is the new All In One production service for the Online Artist that wants top quality sound for reasonable prices. There are millions of talented Indie Artists online on 1000´s of music sites on the Internet. Many of these artists are very talented, but are lacking in mixing and mastering skills. Some of these artists are making CDs to sell on their websites, while others just want their songs to sound the best they possibly can, but can´t afford expensive studio prices. Online Mixing and Mastering is the solution to this problem. 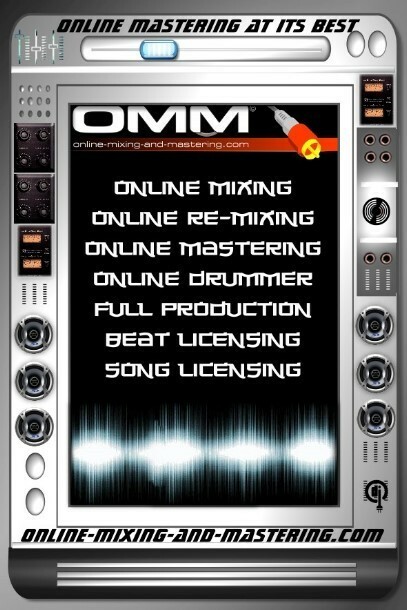 Online Mixing and Mastering specializes in the mastering of CDs and individual songs, but also offers a bundle of other services, such as mixing, editing; remixing, online drummer, full production services and song and beat licensing (...) Mehr anzeigen.